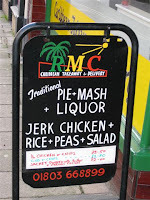 Caribbean food is not regularly to be found round these 'ere parts. But in Paignton, amongst the charity shops and pet grooming salons, is a little gem which I found on my lunch hour today. The lady proprietor had just prepared some kebabs, which I had with rice and peas, and her scrumptious home-made mango chutney. 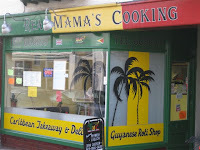 She's from Guyana, and cooks Caribbean/Creole cuisine. Highly recommended. We headed to the grand and beautiful Royal William Yard, formerly a victualling yard for the Navy, to see "The Pigs of Today are the Hams of Tomorrow", some performance art curated by Marina Abramovic. 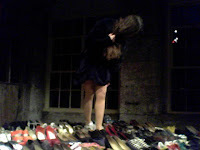 If a woman standing among a hundred pairs of shoes and slowly putting them on, a man sharpening knives in the shadows cast by a swinging bulb, and a butcher dealing with a dead pig are your thing, this was the place to be. We then heard an all-too-brief performance by the Plymouth Complaints Choir, whingeing on about everything from kids not tidying their rooms through to men wearing hats indoors. 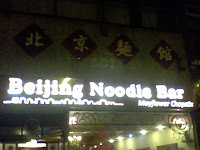 The evening finished with a meal at the Beijing Noodle Bar where my youngest son was harassed - but charmingly so - by the very cute 17 month old daughter of the head waitress, who kept trying to climb up onto his lap. It was a return trip to Anstey's Cove in Torquay - Fawlty Towers and Agatha Christie country - where I'd swum on my own before Christmas. At the time I'd really wanted to swim out to a fairy tale pinnacle which beckoned me like a siren, but I feared doing it on my own. Today I was back there with friends and we made it our mission to swim out there. It was low tide and so we were able to climb round to Redgate Beach (closed to the public because the walkway has been washed away) and swim off there, along the spectacular cliff, to Long Quarry Point, home of the Pinnacle. It was beautiful. Watch the video! The Big Freeze continues. There was more snow today. We walked from Ashburton to the top of Dartmoor - about three hundred metres climbing. Well, it's a good way of saving on the heating - no need to put it on if you're out sweating all day. At the top there were lots of lovely snow drifts - about two feet thick. As I write, the snow is falling and Ashburton is eerily quiet. No cars, just the muffled squeaks of boots on snow, and the shouts of children playing. 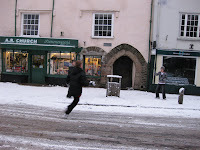 There are snowball fights in the middle of the main street which is usually clogged with cars. It's rather lovely. Well a lot more than a splash actually. A gorgeous swim at Hope Cove, from Outer to Inner Hope, bathed in intense afternoon sunshine that at times was blinding. We met outside the Hope and Anchor pub, where there was a large crowd watching Morris dancers; a lovely congenial atmosphere, perfect for christening the New Year. We ran down the beach at Outer Hope, and waded in...the water wasn't cold and the swimming was fairly easy, though it was a little choppy round the rocks. We swam past the Old Priest and over Barney Bank (the former a rocky finger pointing out to sea, the latter a reef) heading south towards Inner Hope. It was so calm and clear we could swim at a leisurely pace, chatting and enjoying the scenery.